Raza's Footwear includes a variety of brands, Converse, Dickies, Timberland, Anywear Clogs and Cebu. We offer Slip-Resistant shoes for nurses, chefs, and restuarant workers. We also carry workboots for all environments; Slip-resistant, Waterproof, Safety-toe, and many other special features that you may need to get your job done. Along with work we need casual, this is where we bring in the classic Converse Chuck Taylors. We carry a rainbow of colors and designs. We make sure your feet look good too. Raza's Workwear Uniforms has a very large selection of Dickies uniforms. Dickies continues to make sure that whatever your job may be, if you are wearing Dickies brand you are wearing more than 75 years of Quality, Durability, and Comfort. 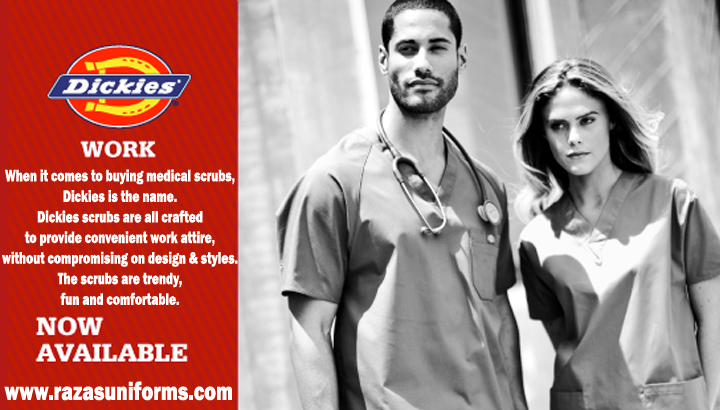 "LET'S GET TO WORK"
Dickies is a powerful brand of uniforms in the medical field. We are priviledged to be an authorized Medical Dickies Retailer. Dickies offers many styles and colors to choose. Quality uniforms for the professional in you. There is something for everyone! "LET'S GET TO WORK"
RAZA’S has the largest inventory of school uniforms in Palm Beach County. This gives customers the confidence to know they will have their style, size, and color available to them whenever they come into the store. Palm Beach School District students can come in at their convenience, try on the uniforms, and buy what they need, when they need it. Private Schools contact us for a unique design and styles.